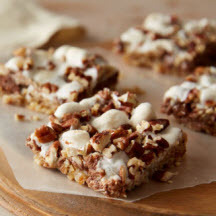 These tasty treats are both salty and sweet with a buttery pretzel crust and a filling loaded with mini chocolate Kisses, miniature marshmallows and chopped pecans. Preheat oven to 350°F (175°C). Grease bottom and sides of 13 x 9 x 2-inch baking pan. Combine pretzels and melted butter in small bowl; press evenly onto bottom of prepared pan. Spread sweetened condensed milk evenly over pretzel layer; layer evenly with chocolates, marshmallows and pecans, in order. Press down firmly on pecans. Bake 20 to 25 minutes or until lightly browned; cool completely in pan on wire rack. Cut into bars.